Your backyard shed is full of old things, and you can’t find the time and energy to clean it out? Better Cleaning Company is a professional rubbish removal Twickenham TW company which excels in home and office garbage clearing and disposal. Get in touch with now - 020 3746 3201. We are experienced in building waste removal Twickenham TW of all kinds, besides harmful and medical waste. Our crew will perform the bulky waste clearance and also debris removal after a your recent home construction. Spend less money, time and lots of efforts and let us collect and remove nearly any kind of waste from your property, book our professional rubbish removal service right away! We are equipped to offer you a fast, thorough garden waste collection Twickenham TW service any day of the year. Our rubbish collectors will appear with a truck and all the equipment necessary to gather, fill up and dispose of your garden waste. That includes green waste removal, brown waste removal, branches, leaves, trees, hedge or grass cuttings, and of course garden waste recycling. Rubbish collection service Twickenham is a complex service that we promise to execute fast and easily. Once the service is arranged for you, expect to have visitation by our expert and trained specialists. They will come to your property for examine in advance and make you an offer for a specific date for the procedure and the finalized price. 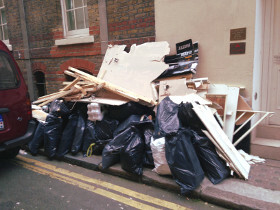 Please, be aware that the rubbish removal services we provide are not hour-based or with fixed prices. We specify these details after the initial check. Once the customer and the rubbish removal team agrees on them, we arrange the procedure. Rubbish Collection In Twickenham TW. Fast Bookings! Take advantage of the many years of experience which Better Cleaning Company had offering rubbish removal Twickenham TW services. We are the most reliable rubbish waste carrier in the area. Our seasoned 2 men groups will show up on time and start loading instantly if you are satisfied with the price offered. We have inexpensive fees and guarantee quick arrival if you require same day service.Call now and 020 3746 3201 we will also recycle on your behalf, so leave the rubbish collection to us and book our service now!